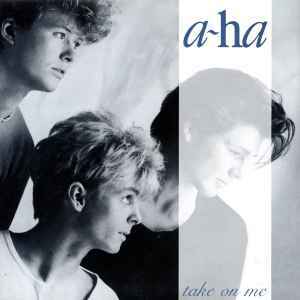 Take On Me is an earlier recording different to the version on "Hunting High & Low". Band name written as 'AHA' on the labels. ℗ 1984 WEA International Inc.
© 1984 A Warner Bros. Recording. Distributed by WEA Records Ltd. A Warner Communications Co.
Track durations not listed on the release. the 7 inch and 12 inch versions are completely different ! the description is wrong ! I own both and the 12 inch is a more minimal version. Without the internet, people would wish for the magic wand, in order to hear any of the song's earlier versions/demos/mixes - hoping for something that could have been rawer, darker and edgier, considering the electro-pop appeal of A-ha's music. Well, for our own information, especially now that we're totally spoiled by the internet's offerings on a plate - it is interesting to explore the origins of the song; the idea for it was conceived years earlier in a power-rock band called Bridges, whose "The Juicy Fruit Song" (and oh dear, it does sound like a late 70s song made for the chewing gum commercial), played with bits that are audible as "Take On Me" in the making. After Bridges split, A-ha were born and something more potent was on the rise due to the group's clever use of synthesizers. A number of rough demos that followed, were pushing the idea further - one of these exists under the title "Lesson One", which might appeal to the fans of the minimal wave genre, but something about the very "Lesson One" also sounds like a bandwagon jumpers' song. Finally the first proper single version appeared on the market. However, despite Morten Harket's ever so impressive multi-octave range, this early commercial version is downright dull, insecure and to an extent even clumsy - the problem is this earlier electro-pop formula for the song sounds calculated, with the word "cliché" screaming along Harket's high notes. The "long version" mix sounds especially dull, making one wonder whether the producer had a hearing problem because the song sounds like rid of most of its main ingredients. Thanks to the far superior Alan Tarney version (and the amazing video), "Take On Me" gained its deserved megahit status ever after, doing the original idea true justice.